A superimposed animation of Leo Messi turns into a big cat, kicks a fireball into an exploding goal, and dribbles all over the streets and boulevards of Barcelona in a short film for sportswear brand Adidas. The 90-second ‘Back in Barcelona’ film has been made to launch Adidas’s Adizero f50, which Adidas describes as "more than a boot". 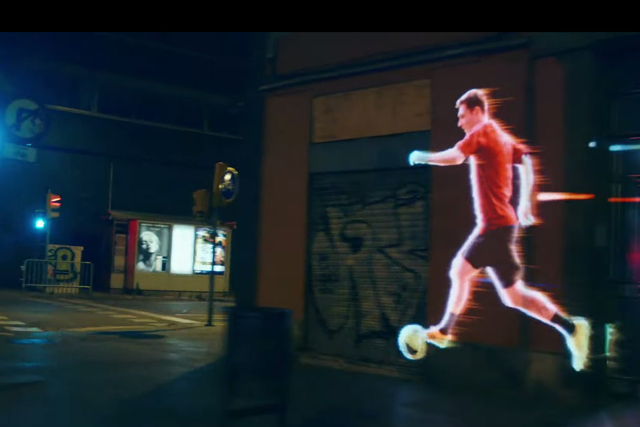 The technique used to create the short, which is glimpsed in the film, involved a vehicle rigged up with projection equipment, moving down the streets as it superimposes Messi's antics and layered animations onto the walls of passing buildings.